You are currently browsing the Dublin Event Guide weblog archives for September, 2018. Autumn has arrived and ALL supermarkets are full of Christmas food. Yes, it is MUCH too early, but we still buy it and that’s why shops want to sell it earlier and earlier. In the events world, we will see a migration away from outdoor events in the next few weeks until March or April when they return. There SHOULD be one interruption around Christmas, when there should be a great outdoor Christmas Market in Dublin, but things are not looking promising AGAIN! Free events will continue though and every week you will find here between 170 and 220! The September bill has now come down to EUR 80 and I really really thank the great donors for that! THANKS a LOT! But unfortunately the calendar never stops and that means, that from Monday, when the next bill is due, the outstanding amount is a whopping EUR 320. That’s a LOT and I really really REALLY need your help with it! Please, if YOU can support the Dublin Event Guide, do so! I am suggesting a very fair EUR 12 for the year, that’s just 23 cent per Dublin Event Guide Edition or just about 2 pints for 52 (!) editions of the Dublin Event Guide! That’s not much if you think about how much value the Dublin Event Guide brings you every week! Higher and lower donations are also appreciated! Every Euro counts! This week’s Feel Good Slot is on the lighter side of quotes. ;-) I hope you can sometimes laugh at yourself! You don’t need to do it in front of other people, in the privacy of your own home is good enough. Enjoy being amused! Last week Lorna L, DB, David M, Mark R, Daire OC and Anne H were so great to help with a very much needed donation. Thanks! Every cent counts and without all these contributions the Dublin Event Guide won’t continue. Comet Records, John F, Nora O’K, David O’K, Karen+Brian F, Estelle K, Ann McP, Noelle H, Pat M, Meav Ni M, Jutta B-S, Jamie C, Leigh Ph, Irene D M, Michael D, Joan S, Melanie B, Anita W, Maria F, Moira dF, Arthur D, Catherine G, Clodagh C, Elaine K, Majella M, Ann M, Clodagh O’C, Claire R, Leigh Ph, Sarah L, Mark G, Erzsebet H, Isidro G, Karen A, Sean S, Melanie M, Zelie McG, Lindsay R, Thibaut D, Pia O, James B, Marguerite D, Shai C, Susan K, Agnieszka S-S, Alice K, Ieva B, Ruth L, Ana RT, Rita B, Sueanne O’H, Rosemary M, Darragh D, Lorraine S, Helena S, Carija I, Pat McK, Jennifer R, Sophie P-L, Jenny B, Catherine F, Stephen S, Juliana A Y, Caoimhe NiM, Damien B, Shane O’B, Melanie S, Audrey H, Catherine E, Michele McN, Susan B, Sharon K, Bill G, Malachy B, Catherine O’S, Paula R, Pamela A, Eleonora P, Thomas B, Karen K, Brendan M, Eric O’F, Gale G, Daniel LG, Mark G, Margo C, Joan S, Debbie C, Karen McG, Eric C, Irish Family Names, Tom McM, Aishling B, Ana RT, Eamonn McG, Silja P, Nicola R, Jacinta O’B, Siobhan B, Orla P, Sharon G, Isidro G, Carmel C, Roisin R, Mona R, Suzanne D, Tracey O’C, Jessica G, Barbara L, Frances D, Emmet R, Irene C, Eugene McG, Stuart N, Laurie F, Joan S, Mark C, Clodagh O’C, Grace L, Peter D, Mona O’R, Maria J, Ryan M, Sharon B, Gennadii N, Tadgh C, Niamh D, Austin M, Belinda B, Brendan D, Cathie S, Margaret P, Eric C, Gerard B, Gareth G, Aine G, Lisa B, Rita B, Brendan McC, Dave H, Sarah D, Jutta B-S, Martin McN, Iulia A, Brendan, Mitzi D’A, Shay, Aideen, Sharon J, Julie O’S, Deirdre W, Leigh P, Sandra L, George K, Anita C, Anna Z, Judith B, P, Liam B, Justin M, Ross M, Daniel LG, Susan F, John F, Melanie B, Mark G, Tadhg C, Scott P, Marile K, Ornaigh G, Sarah H, Cormac F, Eamonn U, Janet L, Gerard Ph, Gabriel K, Frances D, John K, Aislinn T, Barry M, Jaqueline B, Alice K, Paul R, Lorraine M, Susan K, Joan S, Lorna L, DB, David M, Mark R, Daire OC, Anne H and Travel Agency “Project Travel” (www.project-travel.ie Ireland’s only Norway and Northern Lights Travel Experts), Arthur’s Pub (www.arthurspub.ie A classic Dublin old-style pub in 28 Thomas Street with a new and buzzing music venue that runs lots of events), Cycling Campaign (www.dublincycling.ie), www.cfcp.ie (The Centre for Creative Practices is the the only arts centre in Ireland dedicated to connecting, integrating and promoting immigrant, experimental and emerging artists among the local arts scene and audiences). 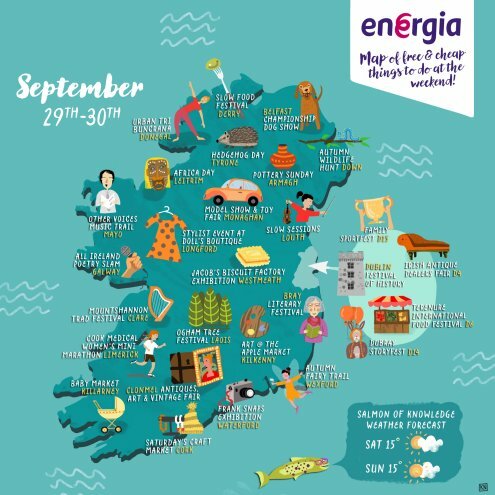 A few suggestions: International Food Festival in Bushy Park, last chance to see Life at the Edges in the Science Gallery, Last Picnic in Mountjoy Square and lots more in the full event list. Yvonne Cullen is a great writing teacher and she teaches creative writing classes for many years with huge success. Dublin is where her classes are mostly based, though she runs regular writing holidays in Inishbofin and Inishturk islands as well. A few times every year Yvonne offers free taster Creative Writing classes to all Dublin Event Guide readers and here is her offer. The next taster classes are happening this week on 01+03 October in the City Centre and on 05 October in Dun Laoghaire. If you want to get a place on either of these free Taster writing classes with Yvonne, then send her an email at yvonnesworkshops@gmail.com and tell her in one sentence why you’d like to attend. (Tell her also that you found out about her classes in the Dublin Event Guide!) Yvonne will allocate places first come first served and you’ll get a reply whether you are successful or not. This is not a competition, but a free offer. (Or a competition with ONLY winners. :-) ) Lica B Browne is offering a free “Energy Healing & Spirit Travel” session for all Dublin Free Event Guide readers. “If your stomach hurts, you take a tablet or visit a doctor. If you feel constantly anxious, you go to a counsellor. Correct? But what about the part of you that’s not physical, who can help heal that? Some research even indicates that physical ailments (dis-ease) start off as energetic. Who can assist then? A competent energy healer like me will. Many of us also suffer on a daily basis, managing physical and emotional pains that can’t be cured with traditional methods. Can energy healing & Spirit Travel really help?! In many cases they can. You’ve already tried the traditional, why not explore something new, like many of my clients: www.meeting-bbrowne.com/testimonial. And you can read more about me and what I do: www.meeting-bbrowne.com/energy-healing. Thank you for giving me an opportunity to heal. T&C & disclaimers apply. Dublin Zoo is slashing their prices every Saturday and Sunday from 29 Sept untl 21 October. The tickets will drop by 50% when bought at the admission gate (not available online!). Since the weather is still good, this might be the best time to go to see Dublin Zoo. Opening hours are 09:30-17:30. Thanks to Liz D for letting me know about this special offer! The end of 1890 numbers! Hurray, one big user of 1890 numbers has stopped using them! The Irish Revenue commissioner loved 1890 numbers and it was difficult sometimes to find the geographical (and cheaper) number, but now they completely stopped using them. A great day for customer service. Many many moons ago when we still had landlines, the phone companies came up with a marketing solution for companies that wanted to provide a better customer service. If a company used a 1890 number then they would pay for part of the call cost and the caller would pay a lower and capped price. Telecom Eireann/Eircom/eir called these numbers “LoCall” numbers and back in the days this was actually correct, But then came mobile phone companies along and in their greed, they ignored the LoCall idea and instead charged a surcharge. :-O For reasons I will never understand, the telecommunications regulator ComReg didn’t stop the mobile phone companies from scamming the customers. But it got worse! When mobile phone companies introduced inclusive minutes, calls to 1890 numbers were not taken out of that minute budget and still cost a surcharge. So if you can avoid them, NEVER use 1890 numbers and tell companies that still use them that they had good intention, but are hurting their customers now. NOBODY should use 1890 numbers anymore! Other numbers to avoid: 1850, 076, 0818 and all 15x numbers. Always look for numbers beginning with a geographical code like “01” etc. The Dublin Theatre Festival is happening from 27 Sept until 14 October and there are not many, but a few free events happening under the “Festival+” headline. All events are free but ticketed, so check them out as soon as possible. They will get booked out! Emma Higgins will exhibit her new paintings in the show “Nightsong”. The exhibition “Papal Visit 1979” is on show in the Phoenix Park Visitor Centre until 30 Sept. The 164th annual exhibition of the Water Colour Society of Ireland will be on show in the Cowshed Gallery in Farmleigh. This is the largest exhibition of watercolours and one of the biggest national group art shows in Ireland. It features more than 120 contemporary Irish artists. A free artistic event will be held every morning of the exhibition at 11:00. These will be watercolour demonstrations by exhibiting artists, talks, guided tours and interactive workshops. The Dublin Sportsfest 2018 is the first ever week-long Sportsfest in Dublin. It will run from 23-30 Sept and will give you a chance to try out lots of different physical activities. Most events are free and the full list is on the website below. There are still a good few events happening on Saturday and some on Sunday. Check the website below. The Ranelagh Arts Festival 2018 takes place from 27 Sept – 06 Oct and there are a number of free events happening as well. A few of them are mentioned in this Dublin Event Guide and the rest can all be found in a downloadable brochure on the website below. The Careerzoo Recruitment event is happening in the CHQ Building. Admission is free, Booking is required but can usually be done on site. This is a day of talks and demonstrations, covering the life and work of George Victor Du Noyer, the artists whose works are on display in the temporary exhibition Stones, Slabs and Seascapes (until 30th September). The day will include demonstrations from contemporary artists showing the wide variety of illustration techniques practised by Du Noyer over a century ago. Admission is free, but booking required via the link here. Suitable for adults. An International Food Festival with about 40 food stalls will take place in Bushy Park and will run in parallel with the weekly Bushy Park Market. International music and dance is provided on the Main Stage from 11:00-16:00 and in “The Lounge” talks and discussions with restaurant owners, bloggers, food photographers, farmer market traders, food journalists and critics will take place from 13:00-14:30. In the Kids Zone, face painting, trampolines, clowns and family yoga will await you. A Family Fun Day as part of the Ranelagh Arts Festival will take place and there will be music, storytelling, face painters, community games. There will also be a vintage carousel, games stall and a prize for the best costume themed “Your Real Life Superhero”. A downloadable brochure of all Ranelagh Arts Festival events can be found via the website below. Sculpture in Context is back!! It is Ireland’s largest outdoor sculpture exhibition and it is a brilliant exhibition in the beautiful surroundings of the National Botanic Gardens. Some of Ireland’s best artists are showing new work and the sculptures are displayed throughout the gardens, ponds, Great Palm House and Curvilinear Range, with the smaller works exhibited in the in the gallery in the Visitors Centre. The exhibition will be open form 06 Sept and will run until 19 October. The Dublin Festival of History runs from 24 September until 07 October and is brought to you by Dublin’s Libraries and Dublin City. There are more than 140 events and all are free. The festival website is here with the full programme. Unfortunately there is no downloadable brochure with a full list of events this year. Most of the events during the week take place in Dublin’s libraries and just a few other venues. There are talks every weekday. The Irish Antique Dealers Association Fair will take place in the Main Hall of the RDS from Friday until Sunday (28-30 Sept). In addition to lots of antique dealers with their antique items, there will be a number of free lectures. Admission to the fair is free, but it seems that you will have to print the “ticket” on the website below. The Craftopia Market will take place on Saturday in Street 55. Last chance to see this exhibition!!! The exhibition is looking at space travel, Mars exploration and it also looks at other hostile or difficult environments like antarctica, volcanoes and living in a floating city. It is a fascinating exhibition, but take your time to understand the exhibits and think a little more about some of them! It is worth it! The super popular Oktoberfest Dublin is back and will take place from Fri 14 Sept – Sat 06 Oct. If you like German Beer (Erdinger Beer), German Food (Bratwurst, Haxn (Pigs Knuckles)) and Bavarian Music (Eeek!) after 16:00, then this event is for you! But be aware that opening times and admission charges have changed substantially again. It once was free, but now you have to pay to be allowed to go there and spend your money for beer and food. Odd, but there are still queues. So the best advise is to go on Tuesday, Wednesday or Sunday. The website ´link is below, but be aware that at the time of writing this, the website was NOT yet updated with the new opening times and rules on all pages. Only the front page was updated. Hopefully it will be fixed before Friday. An Intercultural Tour in Arabic Language with Community Ambassador Asmaa Ashour will take place. Admission is free. Meet in the atrium of the museum. A Family Fun Day, organised by South County Dublin, will happen in Jobstown. All details are on the poster here. Despite the fact that the 8th Amendment is repealed, it seems that the “Marches for Choice” will continue. The next one will take place on Saturday. It will start at the Garden of Remembrance and will finish at Merrion Square. A map of the route is on the Facebook Page below. Come along to this workshop for children aged 6-11 and celebrate Mid-Autumn Festival. Be inspired by the Chinese fairy tale of the rabbit in the moon and make your own Chinese comic book. You will draw, colour, write and book-bind. Admission is free, but booking is required via the link below. At the time of writing there were still some tickets available. To celebrate the 150th Anniversary of the finding of the Ardagh Chalice, join this special tour of the Treasury Exhibition exploring one of Ireland’s most famous and iconic objects. Learn about the people of early medieval Ireland, the influence of the coming of Christianity to Ireland in the 5th century and how the Ardagh Chalice, among other fine metal objects, was made and designed. Admission is free. Places are allocated on a first come first served basis, meet at Reception. Suitable for ages 7+. On Saturdays throughout the Sculpture in Context exhibition, you will have the opportunity to join one of the participating artists for a guided tour. Meet at the Education & Visitor Centre. The St. Mary’s Pro Cathedral not only has a boys choir, but also a girls choir I found out this week. The girls perform every Saturday evening in the vigil mass at 18:00. The Devil’s Spine Band will play a gig in Leeson Lounge. Makings will play electronica-infused rap-rock in Sin E and they will be supported by Rock/Pop/Indie band Fade to Light. The Dead Levees will play Heavy Soul & Blues Rock in Bray. A Dog Show will take place as part of the Ranelagh Arts Festival. Registration will be from 10:00-12:00 and the show will run from 12:00-14:00. More details about the Ranelgah Arts Festival can be found in the downloadable programme brochure on the website below. The National Botanic Gardens run “Kids Drop by Activities” on Sunday. A Drop-in family workshop will take place in the Maples and Calder Creative Space in the Atrium. At this weekly drop-in workshop, children and their parents/guardians/carers are encouraged to work together on creative projects. Drop-in and stay for as long (or as little!) as you wish. The workshops are suitable for children of all ages. The Bray Vintage Car Club is inviting to another Vintage Car Show on Sunday. This is the very last day to see this exhibition! The Last Picnic is a Family Fun Day in Mountjoy Square. There will be music with the Artane Senior Band, the St. George’s Brass Band and the Dublin Concert Band. In addition there will be Magic, an Inflatable Football Pitch, Fencing, Archery, a Mini Carousel, Rock Climbing and some food stalls. The Ardee Concert Band will play a concert on the Bandstand in the gardens of Farmleigh House. “Chinese Food as Medicine” is a demonstration in the lecture theatre of the library. Lei Xue will introduce the principals of using herbs and food in Chinese medicine. Discover this ancient knowledge and learn the importance of selecting food and preparing it to heal, cleanse and regulate the body. The Tour “Bonnets, Bandoliers and Ballot Papers” will look at the changing roles of women at the turn of the 20th Century, through the Way We Wore and Proclaiming a Republic exhibitions. Admission is free. Places are allocated on a first-come first served basis 15 minutes before the tour starts. Suitable for Adults & Children 7+. The talk “Roderic O’Conor: An artist’s perspective” with artist Sandra Hickey will discuss the life and work of Roderic O’Conor from her own perspective as a practising artist. This talk is part of a series of illustrated talks offering artistic and academic perspectives on the “Roderic O’Conor and the Moderns” exhibition. The largest Viking burial site outside of Scandinavia was discovered in the 1840s and 1850s and again in the 1930s during the building of the railway between the south side of the Phoenix Park, stretching over to Islandbridge, revealing over 40 Viking graves. The Irish Bluegrass & Folk band “Mules & Men” will play a gig in the Taphouse. Admission is free. Find more details about the event and the Ranelagh Arts Festival in the downloadable brochure on the website below. South Xpress are playing Funky Blues in the Harbour Bar. From 01-07 October, Positive Ageing Week will take place nationwide. There are around 110 events in Ireland, which is not really much, but the very surprising fact is that in Dublin there will be just about 10 free events. That’s really poor! The full list of events is here, but unfortunately the search function is not working properly. Most free events in Dublin are included in this Dublin Event Guide as individual events. “Johnny Cash and The Politics Of Country Music” is a talk in teh music library. Fifty years ago, American country musician Johnny Cash released his legendary live album, ‘At Folsom Prison’. Daniel Geary will discuss this record in the context of the political tumult of the 1960s and challenge the notion that country music is inherently conservative. Cine-Cafe is inviting to a short film screening during the Ranelagh Arts Festival. The programme will consist of very recent Irish short films, including examples of the latest work of Irish students of film/media and a selection from the latest shorts funded by the Irish Film Board/Screen Ireland. And because 01 Oct is “UN Day of Older Persons”, the screening will finish with a few shorts from ‘Older…’, films made with a substantial input from older-aged people (as either crew or cast). This is a combined tour and art workshop with artist Jane Fogarty focusing on the artist Francis Bacon and his studio. While achieving some measure of success as a young man as an interior designer, once he embarked on his career as a painter, the artist continued to create work into his early eighties. “Conversations on Art” is a Dementia-Friendly Tour in the Chester Beatty Library, specially designed for people living with dementia and their loved ones. Take a break from the everyday and enjoy an afternoon of conversations on art and life. It will start with a relaxing tea or coffee in the Silk Road Café before you will go on a tour of the library’s collections. Admission is free, but limited to 10 Participants per tour and booking is required via the website below. The “Tech Tuesday” at the RCSI will explore advances that are being made in technology to help older people live better lives. Representatives from companies Bonavox, Doro Phone and Pacsana will talk about their research and showcase their products. A guided tours of the exhibition “Seamus Heaney: Listen Now Again” will take place every Tuesday from 02 Oct until 11 Dec in the Bank of Ireland Cultural and Heritage Centre at College Green, entrance is via Westmoreland Street. The Pop-up Art Talk “The Fisherman’s Mother” will be given by Carmel Coyle in Room 18, in front of Helen Mabel Trevor’s painting “The Fisherman’s Mother”. An Information and Support Evening for families and friends of people living with Dementia will take place on Tuesday 02, Wednesday 03 and Thursday 04 October from 18:00-20:00. Admission is free, but booking is required. All details are on the Facebook Page below. The Department of Foreign Affairs and Trade invites to a Public Consultation meeting as part of the process of developing a new White Paper on International Development. It will be on Tuesday in EPIC (The Irish Emigration Museum) in the CHQ Building. If you would like to attend, register at www.irishaid.ie/about-us/policy-for-international-development/getinvolved/ Seats are limited and registration is on a first-come-first-served basis. Admission is free. This talk examines the impact that the Sunday World had on the Sunday newspaper market and Irish society. With its catchy slogans, colour printing and unique approach to journalism, the Sunday World blazed a trail that was hugely successful but which also raised eyebrows in certain quarters. The talk is presented by Joe Breen Journalist, Regina Uí Chollatáin UCD, and Siún Ní Dhuinn RTÉ. At this month’s Dublin event Rory O’Hanlon will give a talk about the alien invertebrates you might come across in your garden – New Zealand flatworm, Red Lily Beetle, Harlequin ladybird, and the landhopper (Arcitalitrus dorrieni), and a little bit about their history in terms of arrival and spread and impact. Invasive species are an increasing problem due to their negative impact on native wildlife. The talk “The First World War and the Armistice” with Dr Jennifer Wellington, UCD Centre for War Studies will take place as part of the Dublin Festival of History. After four years of bloody, industrialisesd warfare, the Great War came to an end on the 11 November 1918. Jennifer will look at the lead-up to the Armstice and its reception in Ireland. At the first event on Tuesday “Black Books” will be screened. The Tour & Talk “From Ballots to Bullets: Ireland 1918 -1919” will explore the intense events and the personal stories behind two momentous years of Irish history. The exhibition curators will speak about how the exhibition came together and the history of the period at 12:00, 13:00 and 14:00. The event will take place at the National Photographic Archive, Meeting House Square, Temple Bar, Dublin 2. The next GradIreland will happen in the RDS on Wednesday. There will be potential employers to talk to, Seminars and Workshops are provided and a CV Clinic can help. Inner City Enterprise (ICE) is launching a Young Entrepreneurs Training programme. It is a five week (2 afternoons per week) programme that will give young people aged between 18 -30 an opportunity to to gain valuable personal development skills as well as practical business advice on how to set up and run a business in Ireland. Admission is free, but an application is required. Find all details on the website below. The talk “The Ardagh Hoard – Discovery, Controversy and Aftermath” with Raghnall O’Floinn will outline a newly-discovered account of the finding of the Ardagh hoard, as well as the subsequent controversy surrounding the circumstances of its discovery, the treatment of the finders and its final acquisition by the Royal Irish Academy. Admission is free, but booking required via educationarch@museum.ie or 01 6486 332. Suitable from age 14. Marking the 50th anniversary of the assassination of Dr. Martin Luther King Jr., this talk by historian Cecelia Hartsell will examine the progression of the American civil rights movement, including the interplay between the federal government and the grassroots activity that Dr. King fostered. “Economic Democracy and the Revolution for a Participatory Society“. Professor Rose Anne Kenny will talk about “How to Age Well: Evidence from TILDA”. She will share findings from TILDA research on the ageing process and how to maintain physical and mental health and wellbeing into older age. Admission is free, but registration is required via the link here. Karl Marx and Ireland is a talk as part of the Dublin Festival of History. Although not central to Marxist thought, the case of Ireland and Irish independence formed an important element of Marx and Engels’ theories on capitalism and colonialism. To commemorate the 200th anniversary of Marx birth, Bernard Kelly, Historian in Residence (Dublin City Library and Archive), will survey his life and examine how 19th century Irish nationalism influenced Marxist ideology. As part of Spaceweek, Dr. Leah Morabito will talk about “A low-frequency radio perspective on AGN”. She will describe how low-frequency radio-astronomy observations, with instruments such as LOFAR, will aid our understanding of the evolution of massive galaxies which harbour supermassive black holes at their centres. Action For Animal Welfare Ireland will be protesting outside the Dail on Thursday and the protest is entitled “There’s No Excuse For Animal Abuse”. Admission is – not surprisingly – free. A tour of the exhibition “Yeats: The Life and Works of William Butler Yeats” introduces William Butler Yeats (1865-1939) – one of the great poets of the twentieth century – and his many interests, including literature, folklore, theatre, politics, the occult and Irish cultural identity. After the tour, you can listen to a selection of voices speaking some of his best loved poems, including Easter 1916. Fred Powell (Professor Emeritus, School of Applied Social Studies, University College Cork) will talk about “The political economy of the Irish Welfare State”. Anthropologist Pauline Garvey from Maynooth University has published a study of IKEA and will launch the book in the Harry Clarke Lecture Theatre of the NCAD. This book represents the first anthropological ethnography of IKEA consumption and goes to the heart of understanding the unique and at times frantic popularity of this iconic transnational store. In 1918 British Authorities attempted to impose restrictions on sports, insisting on a permit system for Gaelic games. The GAA responded with the spectacular Gaelic Sunday on 4th August 1918 when more than 1500 matches were played in defiance of the ban. Presented by Donal Fallon, Historian in Residence (Dublin City Council, North West Area). The next series will take place on Thursdays from 18:30-20:00 between 20 Sept and 25 Oct.
A “Tour for the hard of hearing” will take place in the National Gallery. Meet at the Millennium Wing information desk. Listening devices will be utilised. The BIMM Music College is organising the Midnight Hour on Thursdays in Whelan’s. The First Friday for Startups at DogPatch Labs is a day of talks and mentoring and networking for Startups and all details can be found on the website below. The Pop-up Art Talk “Brazilian animals in seventeenth-century Europe” with Paolo Viscardi will take place in association with the exhibition “Curious Creatures – Frans Post and Brazil”. Meet in the Print Gallery. Chief Keegan are playing funk in Bray. Mik Pyro will play a funk&groove gig in Sin E as part of the Thatchers Haze Sessions. The popular Bionic Rats will play Reggae and Ska in the Grand Social. This event is an evening of words and music about love in 21st Century Ireland. What has changed for the better in the last two decades, what for the worse? What more needs to be done? And what is love anyway? Featuring the work of two award-winning dramatists Philip St John and Phillip McMahon and conversations with celebrated American feminist writer Jessa Crispin and Senator Ivana Bacik, plus a torch-song trio led by one of Ireland’s premier jazz musicians Ronan Guilfoyle. Admission is free, but booking is required via the link here. Doors open at 19:00 and refreshments are available. The walks for September are on 02+09+16+30 September and in October the 07 Oct is already announced. More might be announced. Telephonephobia is a new thing! With surprise I read about a new “problem” in this world. It is the fear of having a phone conversation. The reasons can be manifold. Maybe the information you have to pass on is bad news, or you are concerned that the person you talk to would put you on the sport and you don’t know how to answer a question, or your communication partner is just toooo chatty. Are we hiding behind all these messaging apps? I am not sure if the term Telephonephobia has been used yet for this new type of aversion of using the phone, but it definitely has the danger to become a bit of a problem. A few minutes of a call will create a closer bond with the other person AND will speed up the communication hugely. Have you ever tried to arrange a meeting with someone on messaging platforms only? It can be a pain in the backside to make all arrangements and usually takes a lot longer than a quick call. So I am in favour of using the phone to TALK to people again. ;-) Who is with me?